Recombinant fragment within Human Hsp70 aa 122-264 (N terminal). The exact sequence is proprietary. Epitope mapping with a panel of HSP 70 deletion mutants suggests that the epitope recognized is located between amino acids 122-264 of human HSP 70, a region that has been shown to be involved in ATP binding. This is the first monoclonal antibody reported to react with: 1) The ATP binding region of HSP 70. 2) An epitope in the amino terminus of HSP 70. The HSP 70 family is a set of highly conserved proteins that are induced by a variety of biological stresses, including heat stress, in every organism in which the proteins have been examined. The human HSP 70 family members include: HSP 70, a protein which is strongly inducible in all organisms but which is also constitutively expressed in primate cells; HSP 72, a 72 kDa protein that is induced exclusively under stress conditions; HSC 70, or cognate protein, is a 72 kDa, constitutively expressed, protein which is involved in the uncoating of clathrin coated vesicles; GRP 78, or BiP, is a glucose regulated 78 kDa protein localized in the endoplasmic reticulum; and p75, or HSP 75, a 75 kDa protein that is found within the mitochondria. Our Abpromise guarantee covers the use of ab2787 in the following tested applications. Detects proteins from ~70 kDa to ~78 kDa representing different members of the HSP 70 family. 2-dimensional gel electrophoresis is required to resolve the heat induced form of these proteins from their constitutively expressed counterparts. IP Use at 1-10 µg/mg of lysate. See Balashova et al. Frozen sections from rat brain infarctions from Control (Left), MCAO (Middle) and MCAO + rt-PA treated animals were stained for Hsp 70 using ab2787. (After Figure 4 of Ansar et al). 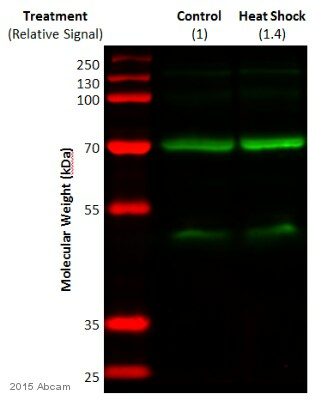 Western blot analysis of Hsp70 was performed by loading 50µg of the indicated whole cell lysates and 15µl of prestained protein ladder onto a 4-20% Tris-HCl polyacrylamide gel. Proteins were transferred to a PVDF membrane and blocked with 5% BSA/TBST for at least 1 hour. The membrane was incubated with ab2787 (1:1000) overnight at 4°C on a rocking platform, washed in TBS-0.1%Tween 20, and incubated with a goat anti-mouse IgG HRP secondary antibody (1:20,000) for at least 1 hour. Chemiluminescent detection was performed. 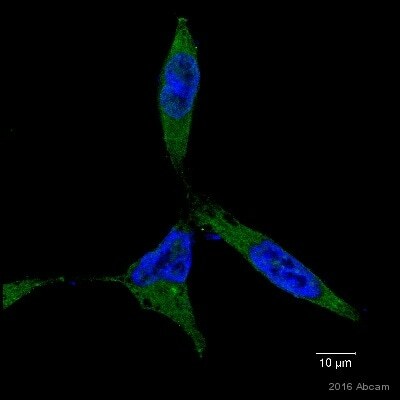 Immunofluorescent analysis of Heat Shock Protein 70 using Heat Shock Protein 70 Monoclonal antibody (5A5) ab2787 shows staining in U251 glioma cells. Heat Shock Protein 70 staining (green) F-Actin staining with Phalloidin (red) and nuclei with DAPI (blue) is shown. Cells were grown on chamber slides and fixed with formaldehyde prior to staining. Cells were probed without (control) or with or an antibody recognizing Heat Shock Protein 70 ab2787 at a dilution of 1/100-1/200 over night at 4oC washed with PBS and incubated with a DyLight-488 conjugated secondary antibody. Images were taken at 60X magnification. Immunohistochemistry was performed on normal biopsies of deparaffinized Human tonsil tissue. To expose target proteins heat induced antigen retrieval was performed using 10mM sodium citrate (pH6.0) buffer microwaved for 8-15 minutes. Following antigen retrieval tissues were blocked in 3% BSA-PBS for 30 minutes at room temperature. Tissues were then probed at a dilution of 1/200 with a mouse monoclonal antibody recognizing Heat Shock Protein 70 (ab2787) or without primary antibody (negative control) overnight at 4°C in a humidified chamber. Tissues were washed extensively with PBST and endogenous peroxidase activity was quenched with a peroxidase suppressor. Detection was performed using a biotin-conjugated secondary antibody and SA-HRP followed by colorimetric detection using DAB. Tissues were counterstained with hematoxylin and prepped for mounting. Overlay histogram showing Jurkat cells stained with ab2787 (red line). The cells were fixed with 4% paraformaldehyde (10 min) and then permeabilized with 0.1% PBS-Tween for 20 min. The cells were then incubated in 1x PBS / 10% normal goat serum / 0.3M glycine to block non-specific protein-protein interactions followed by the antibody (ab2787, 1:100 dilution) for 30 min at 22ºC. The secondary antibody used was DyLight® 488 goat anti-mouse IgG (H+L) (ab96879) at 1:500 dilution for 30 min at 22ºC. Isotype control antibody (black line) was mouse IgG1 [ICIGG1] (ab91353, 2µg/1x106 cells) used under the same conditions. Acquisition of >5,000 events was performed. This antibody gave a positive signal in Jurkat cells fixed with 80% methanol (5min)/permeabilized with 0.1% PBS-Tween for 20 min used under the same conditions. Immunoprecipitation of Hsp70 was performed on HeLa cells. Antigen:antibody complexes were formed by incubating 500µg whole cell lysate with 2µg of ab2787 overnight on a rocking platform at 4°C. The immune complexes were captured on 50µl Protein A/G Agarose, washed extensively, and eluted with buffer. Samples were then resolved on a 4-20% Tris-HCl polyacrylamide gel, transferred to a PVDF membrane, and blocked with 5% BSA/TBST for at least 1 hour. The membrane was incubated with ab2787 (1:1000) overnight rotating at 4°C, washed in TBST, and probed with IP detection reagent-HRP at a dilution of 1:1000 for at least one hour. Chemiluminescent detection was performed. 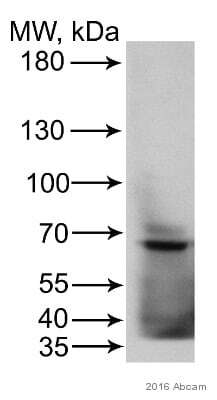 Western blot - Anti-Hsp70 antibody [5A5] (ab2787)Image courtesy of an Abreview submitted by Katherina Brokordt. ab2787 used in Western Blotting at a 1/1000 dilution.Whole tissue lysate prepared from the gill of the gastropod Concholepas concholepas was loaded at 90µg.The positive control used was bovine Heat shock Cognate 70.Secondary used was an HRP-conjugated rabbit anti-mouse at a 1/5000 dilution. 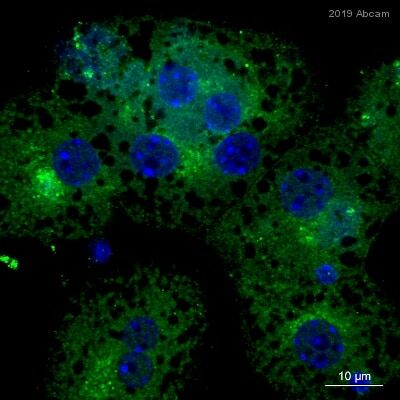 Immunofluorescent analysis of Heat Shock Protein 70 using Heat Shock Protein 70 Monoclonal antibody (5A5) ab2787 shows staining in HeLa cells. Heat Shock Protein 70 staining (green) F-Actin staining with Phalloidin (red) and nuclei with DAPI (blue) is shown. Cells were grown on chamber slides and fixed with formaldehyde prior to staining. Cells were probed without (control) or with or an antibody recognizing Heat Shock Protein 70 ab2787 at a dilution of 1/100-1/200 over night at 4oC washed with PBS and incubated with a DyLight-488 conjugated secondary antibody. Images were taken at 60X magnification. Immunofluorescent analysis of Heat Shock Protein 70 using Heat Shock Protein 70 Monoclonal antibody (5A5) ab2787shows staining in C6 glioma cells. Heat Shock Protein 70 staining (green) F-Actin staining with Phalloidin (red) and nuclei with DAPI (blue) is shown. Cells were grown on chamber slides and fixed with formaldehyde prior to staining. Cells were probed without (right) or with or an antibody recognizing Heat Shock Protein 70 (ab2787) (left) at a dilution of 1/100-1/200 over night at 4oC washed with PBS and incubated with a DyLight-488 conjugated secondary antibody. Images were taken at 60X magnification. Immunofluorescent analysis of Heat Shock Protein 70 (HSP70) (green) in HeLa and NIH3T3 cells. Formalin fixed cells were permeabilized with 0.1% Triton X-100 in TBS for 10 minutes at room temperature and blocked with 1% Blocker BSA for 15 minutes at room temperature. Cells were probed with a HSP70 Monoclonal Antibody, at a dilution of 1:50 for at least 1 hour at room temperature, washed with PBS, and incubated with DyLight 488 goat-anti-mouse IgG secondary antibody at a dilution of 1/400 for 30 minutes at room temperature. Nuclei (blue) were stained with Hoechst 33342 dye. 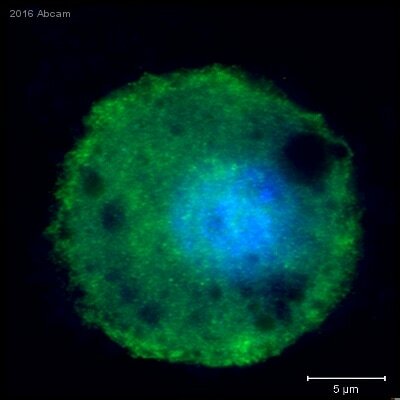 ab2787 staining Hsp70 in 2089 cells by Immunocytochemistry/ Immunofluorescence.Cells were fixed in methanol for 30 minutes at -20 °C, washed with PBS, and incubated in blocking solution (10% human serum in PBS) for 1 hour at room temperature. Cells were stained with ab2787 diluted in blocking solution for 1 hour at room temperature in humidified chambers. Cells were washed with PBS and then incubated with secondary antibody diluted 1/200 in blocking solution for 1 hour at room temperature in opaque humidified chambers. Immunohistochemistry was performed on cancer biopsies of deparaffinized Human prostate carcinoma tissue. To expose target proteins heat induced antigen retrieval was performed using 10mM sodium citrate (pH6.0) buffer microwaved for 8-15 minutes. Following antigen retrieval tissues were blocked in 3% BSA-PBS for 30 minutes at room temperature. Tissues were then probed at a dilution of 1/100 with a mouse monoclonal antibody recognizing Heat Shock Protein 70 (ab2787) or without primary antibody (negative control) overnight at 4°C in a humidified chamber. Tissues were washed extensively with PBST and endogenous peroxidase activity was quenched with a peroxidase suppressor. Detection was performed using a biotin-conjugated secondary antibody and SA-HRP followed by colorimetric detection using DAB. Tissues were counterstained with hematoxylin and prepped for mounting. Immunohistochemistry was performed on normal biopsies of deparaffinized Human testis tissue. To expose target proteins heat induced antigen retrieval was performed using 10mM sodium citrate (pH6.0) buffer microwaved for 8-15 minutes. Following antigen retrieval tissues were blocked in 3% BSA-PBS for 30 minutes at room temperature. Tissues were then probed at a dilution of 1/200 with a mouse monoclonal antibody recognizing Heat Shock Protein 70 (ab2787) or without primary antibody (negative control) overnight at 4°C in a humidified chamber. Tissues were washed extensively with PBST and endogenous peroxidase activity was quenched with a peroxidase suppressor. Detection was performed using a biotin-conjugated secondary antibody and SA-HRP followed by colorimetric detection using DAB. Tissues were counterstained with hematoxylin and prepped for mounting. 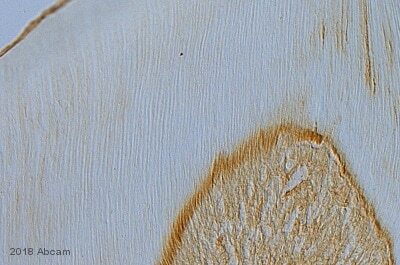 ab2787 staining human skin. Staining is localized to the cytoplasm and nucleus. Left panel: with primary antibody at 1/100. Right panel: isotype control. Sections were stained using an automated system at room temperature. Sections were rehydrated and antigen retrieved. Slides were peroxidase blocked in 3% H2O2 in methanol for 10 minutes. They were then blocked for 10 minutes (containing casein 0.25% in PBS) then incubated with primary antibody for 20 minutes. Colorimetric detection was completed with diaminobenzidine for 5 minutes. Slides were counterstained with Haematoxylin and coverslipped under DePeX. Please note that for manual staining we recommend to optimize the primary antibody concentration and incubation time (overnight incubation), and amplification may be required. Western blot analysis of U2OS cell lysate (30μg/lane) labelling Hsp70 with ab2787 at 1/1000 in 5% milk in TBST for 13 hours at 4ºC. A IRDye® 800-conjugated Goat anti-Mouse polyclonal (1/10000) was used as the secondary antibody. Publishing research using ab2787? Please let us know so that we can cite the reference in this datasheet.